Rather than unveil its new, fifth-generation Clio in full (although you can catch something of a glimpse of the exterior in the video below), Renault has opted to reveal only the hatchback’s fresh interior … for now. So, despite promising the new Clio “rewrites the rule book with more mature body styling” and a “more assertive front end”, for now we’ve been afforded only a look at the revamped cabin. The French firm says the “completely redesigned interior” was inspired by “higher-end segments, both in terms of perceived quality and available technology”. There’s a new soft coating on the three-part facia, door panels and central console surround, while Renault claims the cabin is more “driver focused” than that of the outgoing model. That said, you’ll likely notice the presence of an electric parking brake rather than a traditional lever. It’s also hard to miss that 9,3-inch multimedia screen, which is the largest ever used in a Renault. It’s vertically positioned and slightly angled towards the driver, and will run the brand’s latest “Easy Link” system. The traditional analogue display, meanwhile, has been replaced by a customisable digital TFT screen offered in two sizes (seven and 10 inches). The 10-inch version will include navigation in the display. 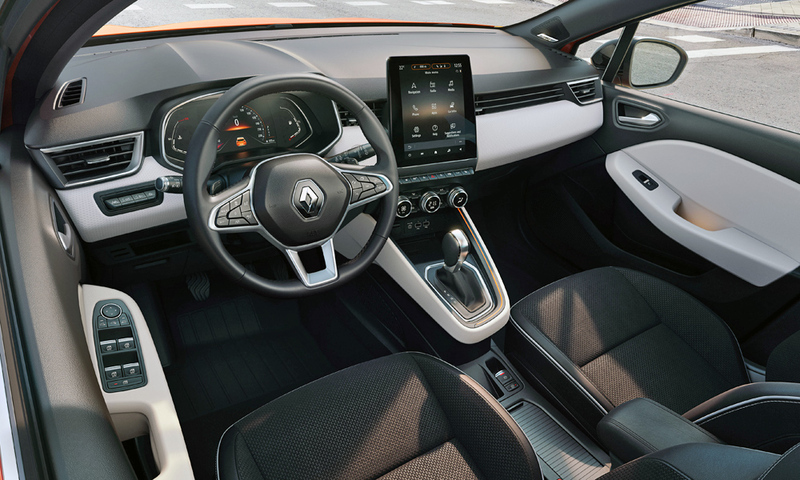 There’s also a new, smaller steering wheel (made possible by the fitment of a more compact airbag) that Renault claims improves dashboard visibility for the driver. It is equipped with a thumb rest, a broader hoop and back-lit controls. The new central console (which can be equipped with a wireless smartphone charging function) has been positioned higher for “enhanced ergonomics” and houses a shorter gear lever. The console itself can be customised depending on the interior design scheme and features lighting on its outer edge. Renault has also redesigned the Clio’s seats, claiming they provide “better support through a longer seat base and a more enveloping shape”. The semi-soft shell, meanwhile, ostensibly improves knee space for rear passengers.